You couldn’t buy a better review for a Broadway show than the one that ran in today’s NYTimes praising the new musical “Honeymoon in Vegas,” first staged in the fall of 2013 at the Paper Mill Playhouse in Millburn, NJ. The producers must have known they had a hit because they opened their ring-a-ding-ding show post-Christmas in weather-challenged January and on a Thursday night so the review would be the lede story on the Friday cover of the Times’ Arts section — prime real estate. Paper Mill becoming a Broadway crucible? 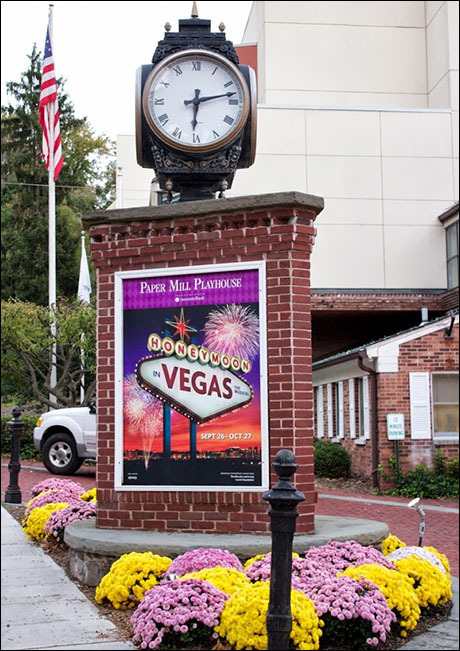 “Exterior of the Paper Mill Playhouse in Millburn, NJ. This is the second Paper Mill production recently staged at the 1200-seat regional theater in Millburn that moved straight to Broadway. “Newsies” was done there in the fall of 2011 before beginning previews on Broadway in August 2012. Paper Mill is hosting the US premiere of Alan Menken/Stephen Schwartz’s “The Hunchback of Notre Dame” from March 4 through April 5. That seems ripe for moving to NYC. Plus, the final show of the Paper Mill’s season is a world premiere. “Ever After” will be directed and choreographed by three-time Tony winner Kathleen Marshall (who has been involved with 17 Broadway shows, including “Anything Goes,” “Grease,” “The Pajama Game”) and run from May 21-Jun 21. Now there’s a no-brainer for the Great White Way. The new musical is based on the 1998 film starring Drew Barrymore and Anjelica Huston. The cast has not yet been announced. 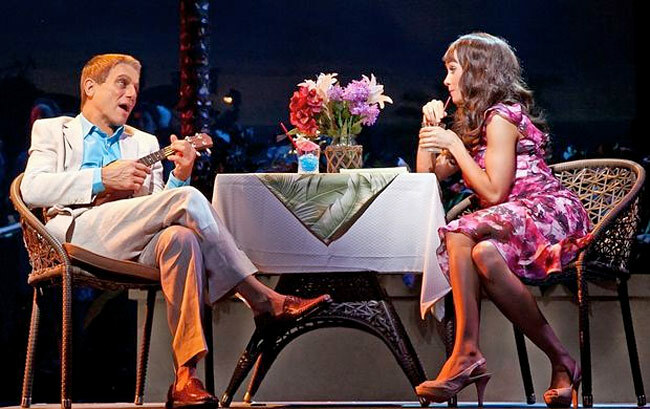 It’s expensive to develop new musicals for Broadway in NYC. But these days it’s hard to recreate the old, traditional out-of-town tryouts in Chicago or Boston where the kinks and problems can be worked out. Social media alone will spread the word — good or bad. Paper Mill is cheaper than NYC and close enough for the cast ands crew to commute. New Jersey theatergoers can rejoice if the trend continues. Tickets and parking are much cheaper than in NYC. Click here to order tickets to the Broadway show. Click here to read what the NY Daily News had to say. Click here for what Marilyn Stasio of Variety had to say. Click here for what Hayley Levitt of TheaterMania.com had to say.